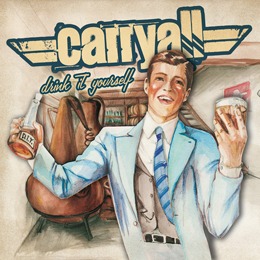 Carry-All is a ska punk band from Italy. They have already been around since 2002, but they are pretty unknown outside of their own country. A few weeks ago, they released their new record, Drink It Yourself. This was a DIY project which went together with the unfortunate event of the departure of both the original drummer and bass player of the band. They didn't let this letdown get to them and recorded Drink It Yourself in their practice room and produced it themselves. When listening to the album, the last thing you should think is that so much misfortune hit them recently. Everything sounds very professional and often, it even makes me think of bands such as Rise Against and Authority Zero. Perhaps the only element that gives away their true identity is their Italian accent, but the band Actionmen has already proven in the past that that is just an extra. Fans of some good punk rock should definitely go and look for the new record by these pizzaboys in Carry-All.